One more under my fishing belt! Mr. and Mrs. Jones are experienced fishing people, they have traveled to many places and don’t waist time thinking what they going to do, a fishing trip is number one on their what to do list and that is exactly what they did in their vacation trip to the Cayman Islands and we didn’t disappoint them. Weather was a little choppy but that did not worry the Jones from Texas. We started trolling around the North West Point, about 5 miles from shore, then after a while one of the lines took off screaming Fish on! we knew that was a wahoo. The line went down and Mr. Jones jumped on the fighting chair ready for the action. 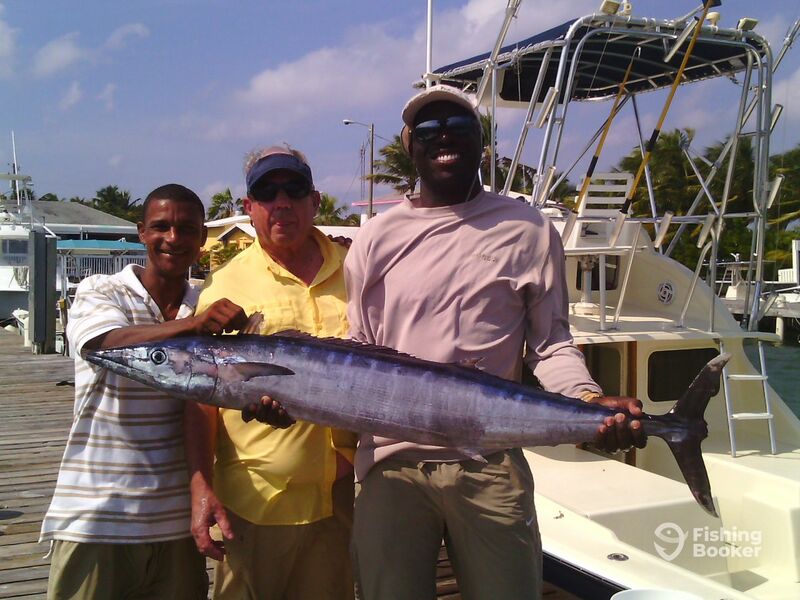 This fish was a reel stubborn fighter but an avid fisherman never give up, it took some time to bring it in but it was laded at last, a nice 30+ pounder wahoo under Mr. Jones’s fishing Belt. Well done Mr. and Mrs. Jones. ‘Till next wave, keep reeling!